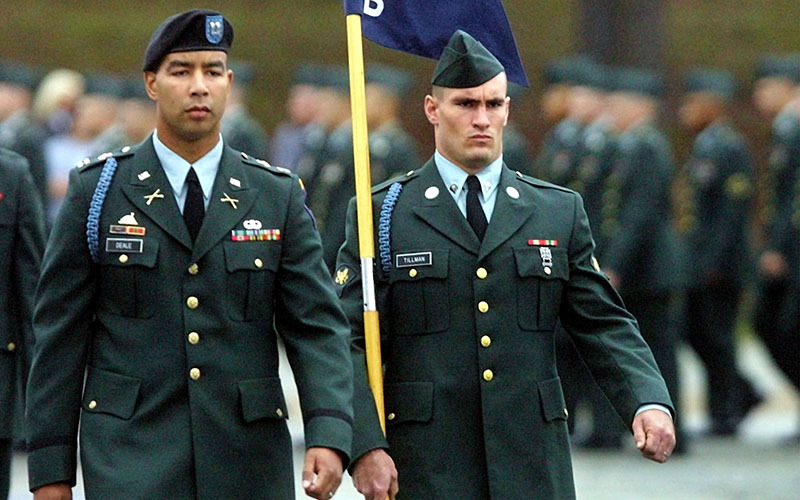 Pat Tillman's hometown works overtime to protect his legacy. ALMADEN VALLEY, Calif. – About 20 miles south of San Francisco Bay, a gentle wind disturbs an otherwise peaceful afternoon in Almaden Valley. The breeze funnels between the rolling hills that encircle the community, detected only by the shuddering blades of turf on the football field at Leland High School. With each gust, a U.S. flag hanging beyond the end zone is blown toward the distant tree-lined ridges on the horizon. 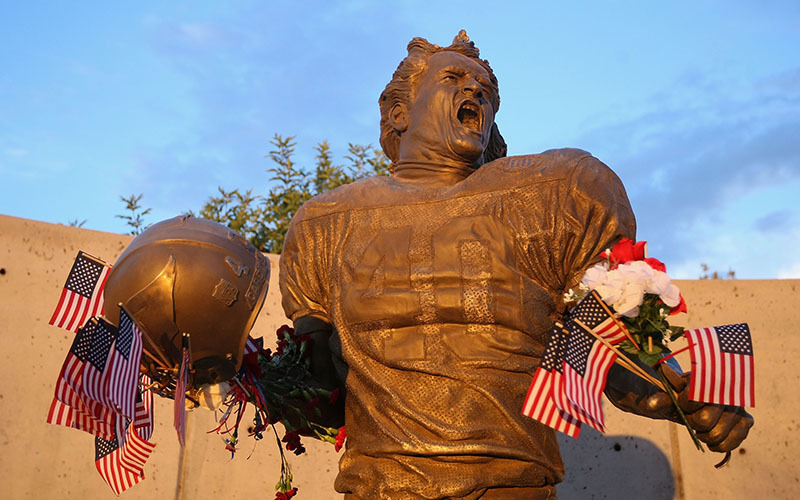 It’s one of the modest ways the people of Pat Tillman’s hometown in south San Jose have tried to solve the complex and impossible question: How do you honor a hero? Outside of Almaden, the answers are different. Beyond these hills, Tillman’s legacy of football, service and sacrifice has been celebrated to the point of celebrity. His name has been propagated with pride, the retelling of his courageous story amplified and spread like an American gospel. In the 14 years since his death, he is worshiped more than ever. To the country he gave his life for, he’s an icon of nobility and morality but also of nationalistic and military pride. Most of the remembrances are pure, carrying on the causes he left behind. Unlike much of the nation, Tillman’s legacy is still guarded in this quiet neighborhood, his memories considered sacred around the high school he came through. They are cautious in how they cherish their fallen son. Their remembrances are kept simple, believing it is the best way to uphold the values he embraced, the traits he learned among these winding suburban streets. “There’s a sense that it’s a smaller, closer, more intimate, more close-knit situation here with Pat,” says Mike Ward, coach of the Leland football team. If it takes a village to raise a child, then most of Almaden Valley helped to form Tillman into the man he became. His journey to adulthood was much like the hilly terrain that surrounds the setting, full of ups and downs. Residents here can recall his highs, such as when he led Leland High School to a 1993 Sectional Championship, and helped him through some of his deepest lows, including when he was arrested months later after getting in a street fight protecting a friend. They don’t pretend to forget his flaws — those shortcomings can be learned from. The people here adore Tillman for the same reasons many others do. They celebrated his football accomplishments at Arizona State and with the Arizona Cardinals. Like the rest of the country, he was admired for his decision in 2002 to leave the sport and join the military. His tragic death fighting in Afghanistan two years later is burned into their memories too, an imprint that induces as much pride as it does pain. When his widow, Marie Tillman, who began dating Tillman when they were teenagers, wrote a Washington Post op-ed last week about how her late husband should be remembered, she could have been speaking for the entire town that she and Tillman called home. There is little pomp or circumstance associated with Tillman’s name at Leland. The handful of public displays dedicated to his memory around the 51-year-old campus are modest, such as the stadium name, or his box-framed jersey hanging in a back corner of the front office, or the number 42 posted on door frames inside the football locker room. Anything more might feel like too much. They’re wary of the way outsiders can manipulate his image. They see how around the country Tillman’s name has become synonymous with the military and, by extension, patriotic pride — and believe some have weaponized his memory as ammunition for political debate and gain. 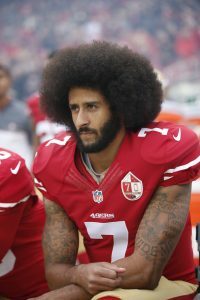 When Colin Kaepernick dropped to a knee during the national anthem two years ago, Tillman’s name got caught in the middle, used as a common rallying cry attempting to discredit the NFL anthem protests: Pat Tillman would never kneel for the national anthem and neither should we. Others argued the opposite, taking his reported disdain for the justification of the war that took his life as evidence that America needs to bring its troops home: Pat Tillman would never support the involvement in a foreign war and neither should we. The tug-of-war over his image has taken a toll on those in Almaden. “When people come out now and say, ‘Pat would say this,’ or ‘Pat would feel like that,’ it’s like, no, you don’t know how Pat would feel,” says Robert Braunstein a high school sports reporter who graduated from Leland, covered Tillman’s playing days there and has lived in Almaden for the better part of 52 years. At Leland, Tillman’s life is compartmentalized: Scholar. Soldier. Football player. They use his legacy to accomplish one important mission: to show he’s a role model of honesty and integrity to the students at his alma mater, an example of the right way to live a life. Tillman’s legacy serves different purposes elsewhere. 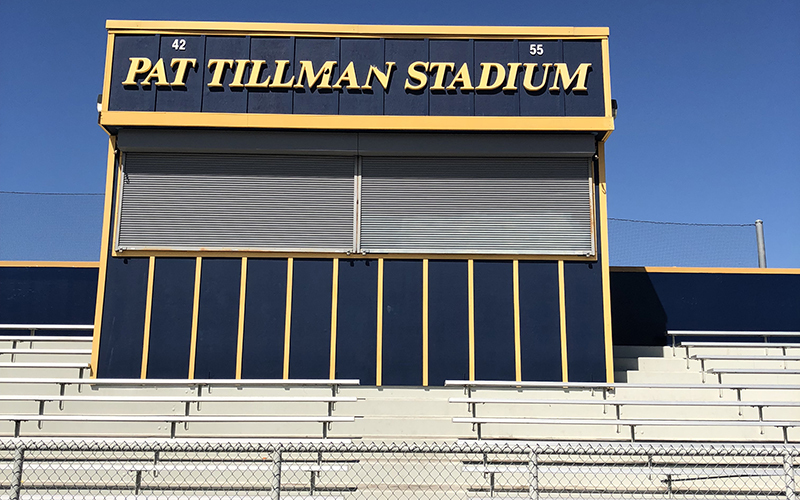 At his collegiate alma mater, Tillman’s memory is everywhere: on the jerseys and shirts bearing his name that are sold around campus, on his newly built statue inside Sun Devil Stadium, a life-sized centerpiece to the venue’s recent renovations, and on the foundation created by his family in his name that provides military veterans with scholarships and other vital aid. Even before he picked the Army over the NFL, Tillman obtained a celebrity status in Arizona that would have never been possible in his hometown. Fifteen years after his death, he remains as big of a deal now as he ever was during his playing days. Grandiose tributes to him around ASU and the entire state of Arizona are as familiar as the desert sun. The annual 4.2-mile Pat’s Run has become a mecca for the thousands wanting to honor him. The memorialization of Tillman’s life began organically at first. After he died, people began giving money to the school, Tammaro said. Unsolicited checks came pouring in and children across the country sent envelopes stuffed with dollar bills to Tempe. It set the groundwork for the Tillman Foundation to grow. Now, the glory given to his life helps advance the things he cared about the most. His university, his football team and his fellow men and women in the armed forces all benefit from the spotlight that illuminates his memory. “Is that the right word? 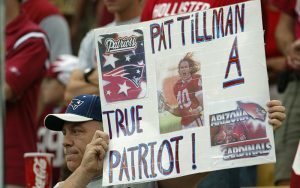 Unquantifiable?” he asked aloud, before nodding in self-affirmation, finding a fitting term to describe Tillman’s larger-than-life legacy in Arizona. Tillman’s exaltation in the state has been born out of noble intentions, with the blessing of his family and for the good of the community that treasured him. But making his legacy so prominent has its pitfalls too, creating a pathway for his name to become a political reference point as well. There’s an irony to the contrast between the groups of people Tillman left behind in Almaden and Arizona. One protects Tillman’s name for fear he will be remembered the wrong way. The other projects it for fear he won’t be remembered at all. In the end, neither can prevent him from being periodically turned into a propagandic pawn, those who knew him say. The exploitation frustrates them. To some extent, though, it’s tolerable to Tammaro. Social debates are an American ideal, and though some may falsely claim to know where Tillman’s views would fall today, Tammaro thinks the fact his name still gets brought up shows the impact his legacy has made. Not everyone wears such thick skin. On the Friday afternoon of Leland’s homecoming weekend, coach Ward enters a dusty shed and drags out folded canopies, stopping to wipe away the beads of sweat escaping his brow. Later, he’ll have a football game on his mind. Right now, he’s helping students set up. Ward arrived here as an assistant coach in the summer of 2015, when he and his wife moved from Miami to start a family in peaceful Almaden — likely the closest you’ll come to finding Mayberry in booming Silicon Valley. Back then, no one gave Ward a playbook for how to handle the Tillman heritage. At first, Ward was completely unaware of who the school’s most distinguished alumus was at all. “It was like the second day, we were out here at practice and I saw that,” he says, jerking his head toward a blue wooden press box spelling out the stadium’s name in the same big white block letters. Ever since, Ward — who was promoted to head coach after his first season at the school — has learned the delicate way the community honors Tillman. Within his program, he’s gone about carefully emphasizing the best parts of who Tillman was. Little things, like showing his players the Football Life documentary done about his life, or posting his number 42 up on the press box, make a big difference. Matt Ames is the perfect example. The junior offensive lineman at Leland has always known of Tillman’s local past. His dad, Brian, went to school with Tillman, graduating a few years before him. For Matt, the word-of-mouth stories and simple symbols he feels daily have made an impact. Ward senses that feeling burning in most of his other players too. In September, the team came to Peoria to play Liberty High in the “Pat Tillman Classic,” the first of a home-and-home series. And since 2011, the school has hosted an annual “Tillman Legacy Classic” game at the beginning of the season. It’s become the football team’s contribution to the safeguarding of Tillman’s good name. This year, when they lost after blowing a halftime lead, the group was distraught. Losing that game “feels like you let him down, in a way,” Matt says. On this Friday, the team’s final home game of the season, Wards’ boys produce a different result. A long touchdown pass with 11 seconds left breaks a tie, sending his seniors out of Pat Tillman Stadium for the last time as winners and leaving the coach exhausted and gasping for air as they huddle around him. He doesn’t say Tillman’s name, nor does he think about his legacy while trying to coach a coordinated collision of bodies from the sidelines. But as he recites the same words so often associated with Tillman’s memory, it provides at least one more modest and pure solution to the complicated question. How can you honor a hero? Perhaps, simply, by competing as he would.